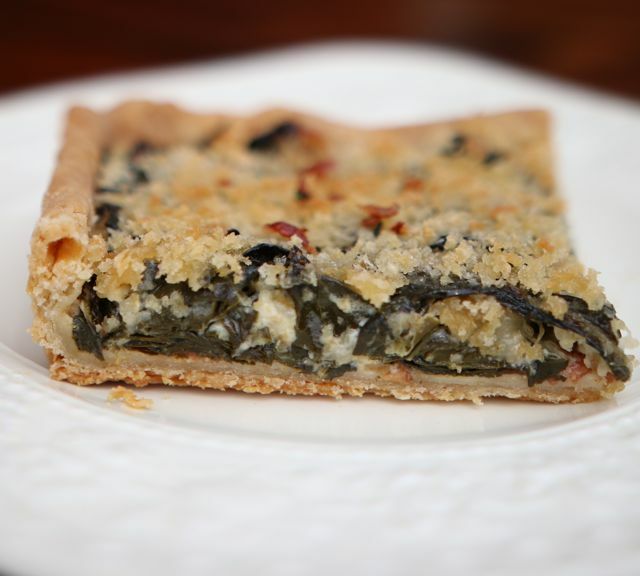 Collard Tart au Gratin – Creamy, cheesy, and packed with wholesome collards, this is green cuisine at its finest. Not every phase of writing a cookbook is what I’d call fun – there’s so much testing, retesting, editing, re-editing, and small-stuff-sweating that your head can start to swim. But now we’re at the point where photos have been shot and page proofs are ready; this is fun. The many pieces are starting to cohere and feel like a real book. Cover designs pass back and forth, some of which the author isn’t crazy about, causing publisher – one imagines – to gaze heavenward and wonder why they bother to hire difficult authors like me. We’re all part of the same team, though, and in the end it’s all for the sake of producing a winning cookbook, which I hope…and believe…Dinner Pies will be. 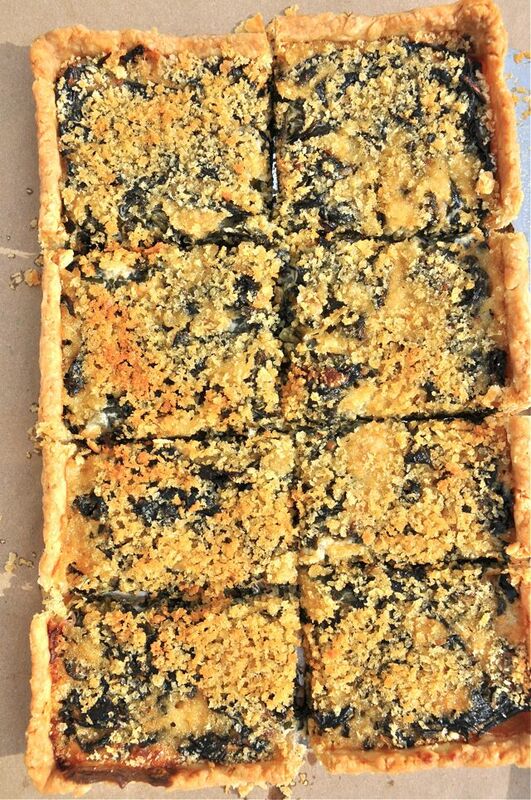 Unless you’ve hacked into my computer and stolen the recipe, you’ve probably never had a tart like this, so let me help. Imagine the best creamed spinach you’ve ever eaten. Now replace the spinach with more full-bodied collards, add Parmesan cheese, then bake all these tender creamy greens in a flaky pastry topped with buttery panko bread crumbs – the au gratin part of the whole shebang. 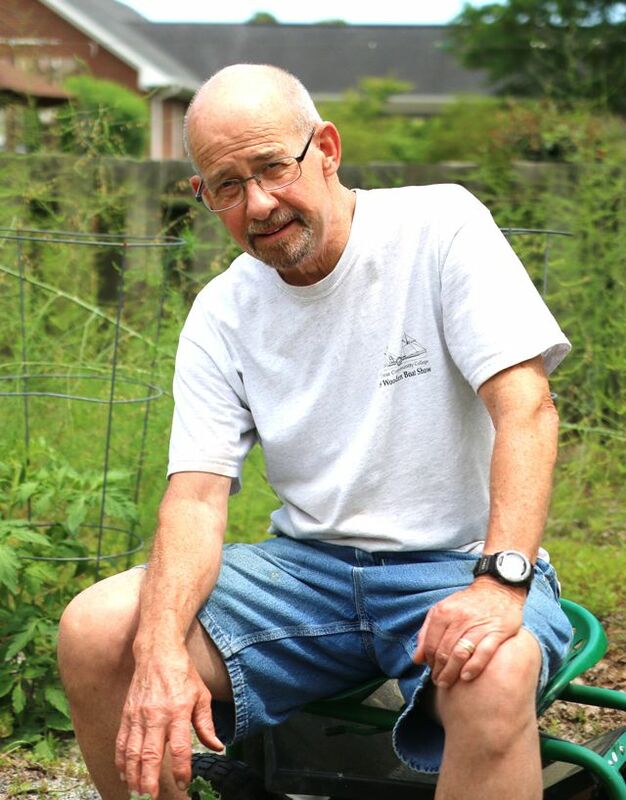 Growing collards isn’t actually Dean’s day job; boat building is. He’s more than two years into a 26′ Dory Skiff and it promises to cut a mean profile off the coast later this summer when it rolls out of his backyard and down to the water. It’s inspiring to see his craft take shape and one can’t help but admire his dedication: building a boat isn’t exactly all fun and games, either. It’s a tad late in the season for fresh collards – Dean’s or anyone else’s – but you can still find the fresh, prepackaged kind. Unless they’re picked early, collards have a thick central stem running the length of the leaves. It’s important to remove these stems because they’re not as tender as the leaves and take much longer to cook, so they’ll be a chewy nuisance if you don’t get rid of them. Collards love pork, so we saute the greens in bacon fat then simmer them in a little chicken stock; the bacon itself is crumbled onto the tart shell. We add some cream to the greens, then the Parmesan. The starch from a grated potato helps bind the liquid, so no eggs or other thickener is needed to hold the filling together. More often than not, I’ll just slice the tart into large pieces and serve it as the centerpiece of a meal. Cut it in slightly smaller pieces, and it makes a snazzy replacement for any green vegetable you’d serve with a roast pork or chicken. Indeed, there’s really no wrong way to serve this other than not serving it at all. I’ll post a few more recipes from Dinner Pies leading up to its release this fall. As soon as we have a final cover design, we’re planning a special pre-publication sale also, so stay tuned for that. And if you’re lucky enough to attend our upcoming Lowcountry Pie Getaway this fall in Charleston, South Carolina – the details of which will be announced by the end of this month – Dinner Pies is just one of the cool gifts you’ll find in your getaway swag bag. 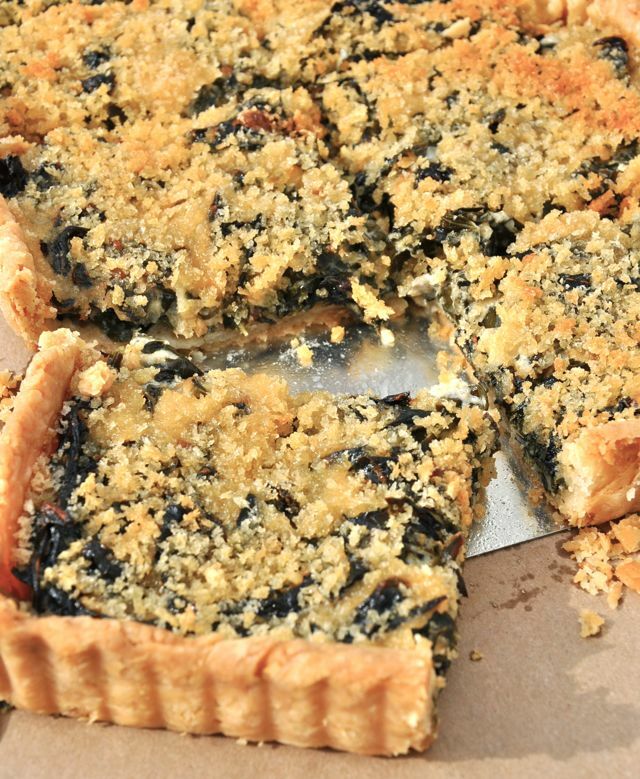 Enjoy the tart and – as always – let me know what you think. It’s great getting your emails and I appreciate each and every one of them. Preheat the oven to 375°. Prick the bottom of the refrigerated shell 6 or 7 times with a fork. Carefully - so you don't mangle the shell - line the tart shell with a piece of aluminum foil, pressing it into the creases so it fits like a glove. Add a thick layer of dried beans, banking them up the sides to keep the pastry from moving. If your pan has a removable bottom, place the pan on a baking sheet to prevent butter from leaking into your oven. Bake the shell for 25 minutes, then slide it out and carefully remove the foil and beans. Repoke the holes if they've closed up, then slide the shell back in and bake another 5 to 8 minutes. It may be light golden at this point, but don't worry if it isn't. Place the pan - or the entire sheet and pan - on a cooling rack and cool thoroughly. MAKE THE FILLING: Cut out and remove the center stems from the collards. If you're using whole leaves, stack and cut them crosswise into narrow, 1/2-inch wide strips. If the collards are pre-chopped, just tear off the stems and put the leaves aside. Place the leaves in a tub of water and agitate well, to clean. Drain in a colander and set aside. You should have 8 to 10 firmly packed cups of leaves. In a very large stovetop casserole or pot, cook the bacon until crisp. Transfer the bacon to a plate; cool. Add the onion to the bacon fat and saute over moderate heat for 7 to 8 minutes. Add the collards. Saute for 5 minutes, turning frequently with tongs to stir them up. Add the chicken stock. Using the large holes of a box grater, grate the half potato and immediately add the gratings to the pan. Add 1/4 teaspoon salt, or slightly more if you're using low sodium stock. Bring to a simmer. Cover and gently braise the collards for about 15 minutes, until tender. Check the liquid level during the last 5 minutes. By the time the collards are done there should be just a glaze of liquid left in the pan, so you may need to uncover the pot for the last few minutes to cook off the excess liquid. Pepper the greens, to taste. Stir the heavy cream into the greens and bring to a boil. Gently boil the greens for 2 to 3 minutes to thicken them up a bit. Remove from the heat and stir in the Parmesan cheese. Set aside while you preheat the oven to 350°. Crumble the bacon into the tart shell. Add the collards, spreading everything evenly in the shell. Bake on the center oven rack for 30 minutes. Slide out the tart and carefully sprinkle the panko crumbs evenly over the filling. Spoon the melted butter over the crumbs. Bake the tart another 15 to 20 minutes, until the crumbs are golden. Transfer the tart to a rack and cool for at least 25 to 30 minutes before slicing. Makes 8 servings.